Fig. 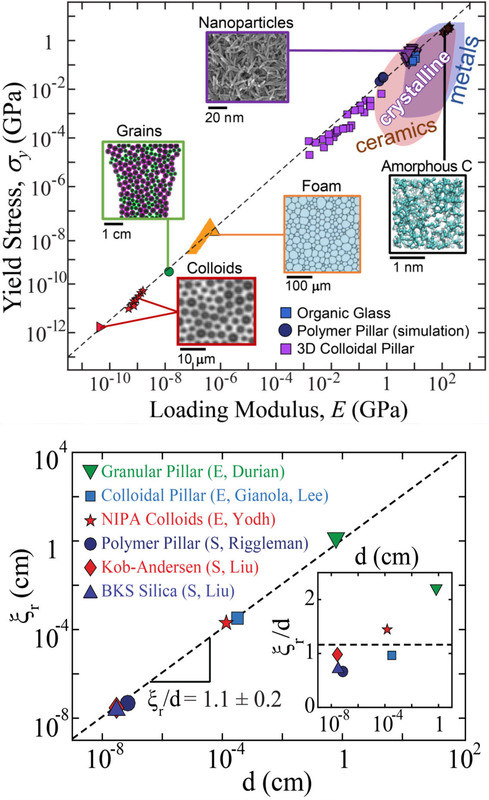 1 (top) shows yield stress vs modulus for disordered solids (IRG 1 data) and crystalline solids (balloons). Remarkably, the yield stress is tightly distributed around 3% for systems spanning over 13 decades in modulus. Fig. 1 (bottom) shows the size of rearrangements vs particle size for 6 systems (3 experimental, 3 computational) spanning nearly 7 orders of magnitude of particle size. Inset shows that the size (exponential length scale) of rearrangements is universally about one particle diameter at low strains. Glassy materials are characterized by a lack of long-range order, whether at the atomic level or at much larger length scales. But to what extent is their commonality in the behavior retained at these different scales? Cubuk et al. used experiments and simulations to show universality across seven orders of magnitude in length. Particle rearrangements in such systems are mediated by defects that are on the order of a few particle diameters. These rearrangements correlate with the material's softness and yielding behavior. When deformed beyond their elastic limits, crystalline solids flow plastically via particle rearrangements localized around structural defects. Disordered solids also flow, but without obvious structural defects. We link structure to plasticity in disordered solids via a microscopic structural quantity, “softness,” designed by machine learning to be maximally predictive of rearrangements. Experimental results and computations enabled us to measure the spatial correlations and strain response of softness, as well as two measures of plasticity: the size of rearrangements and the yield strain. All four quantities maintained remarkable commonality in their values for disordered packings of objects ranging from atoms to grains, spanning seven orders of magnitude in diameter and 13 orders of magnitude in elastic modulus. These commonalities link the spatial correlations and strain response of softness to rearrangement size and yield strain, respectively.